AIB released a new video with Kangana Ranaut on the nepotism going on in Bollywood industry. 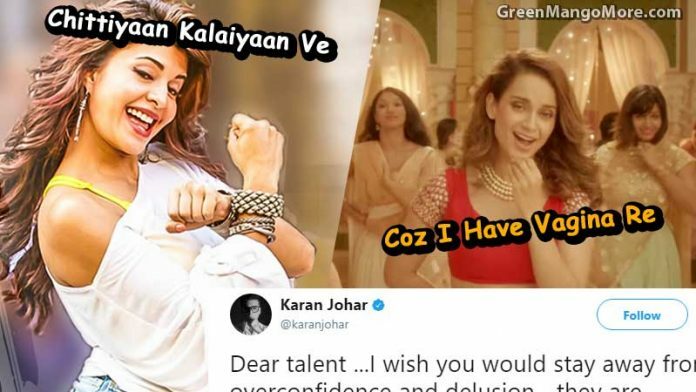 Kangana was recently got into controversy because of her shocking statements on Hrithik and her relationship, Karan Johar, Aditya Pancholi, and others. Now she nailed it with collaborating with AIB. You will see her taking dig Karan Johar, Shahrukh Khan, and Hrithik Roshan. There are several lines that expose Bollywood’s behaviour towards actresses. Her highlighted line that is enough to burn industries big stars like Shah Rukh and Salman, signing much smaller age actresses opposite them. “Main Hoon Kitni Young, Is Buddhe Ke Sang…Buzurg Hai Mera Piya”. Another line on nepotism: “Papa Ne Tujhko Launch Kiya Re… Main Boli To Tune Taunt Kiya Re”. But seems like Karan Johar didn’t like the truth. Soon after the song launched, he posted a message for AIB on tweeter. Dear talent …I wish you would stay away from overconfidence and delusion….they are constantly conspiring against you…don’t you see it? Seems like Kangana declaired war against the key people of Bollywood. Next articleApple Lunched iPhone 8 and X, Twitter Couldn’t Stop Trolling It!